Last week’s blog was an introduction to the vulnerabilities that we face with the deterioration of our oceans. It paid particular attention to the recently published study of evidence associating the 4th mass extinction with ocean deoxygenation – which effectively suffocated all existing oceanic life. The first method lists the rapid (on a geological time scale) physical changes that oceans are experiencing; left unabated such transformations will eventually extinguish all life within these bodies of water. I am citing information from the Climate Science Special Report: Fourth National Climate Assessment (CSSR NCA4), Volume I (see August 15, 2017 and January 30, 2018 blogs), an authoritative evaluation of the science of climate change, with a focus on the United States, as mandated by the Global Change Research Act of 1990. The second approach relies on recently compiled data in the Ocean Health Index. This new methodology was initiated by a group of scientists who held the opinion that the current attitude of describing the health of oceans is based too heavily on negative indicators. Instead, they proposed an index anchored on a popular definition of sustainability and mostly measured in the territorial waters of individual countries. Anthropogenic perturbations to the global Earth system have included important alterations in the chemical composition, temperature, and circulation of the oceans. Some of these changes will be distinguishable from the background natural variability in nearly half of the global open ocean within a decade, with important consequences for marine ecosystems and their services. However, the timeframe for detection will vary depending on the parameter featured. Here I will show some data on the recent accumulation of ocean heat content and ocean heat feedback as they have major impacts on sea level rise. Future blogs will focus on the other indicators that are only mentioned briefly here. Chapter 12 of the CSSR report is fully devoted to sea level rise, which I have repeatedly discussed. Global Ocean heat content change time series. 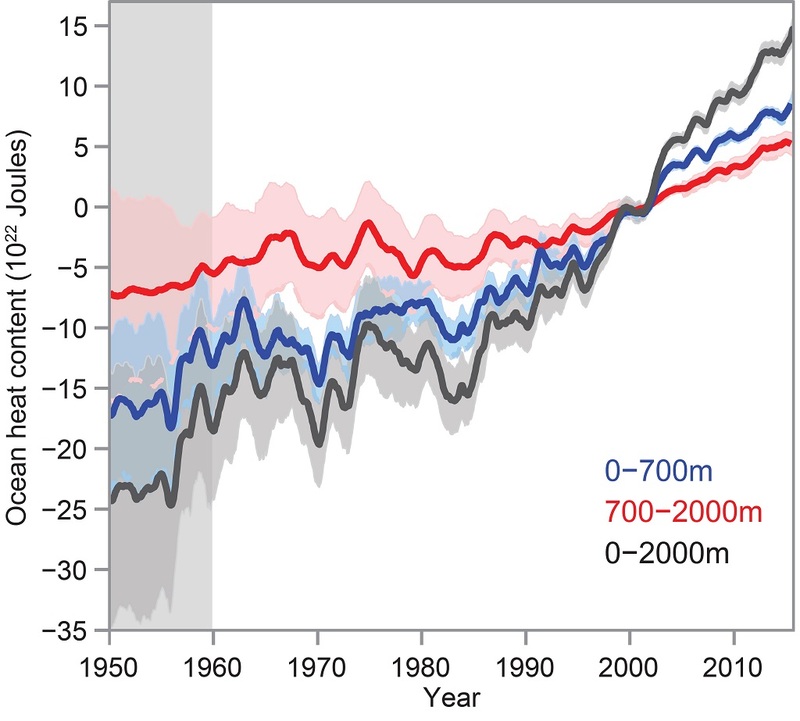 Ocean heat content from 0 to 700 m (blue), 700 to 2,000 m (red), and 0 to 2,000 m (dark gray) from 1955 to 2015 with an uncertainty interval of ±2 standard deviations shown in shading. All time series of the analysis performed by Cheng et al. are smoothed by a 12-month running mean filter, relative to the 1997–2005 base period. (Figure source: Cheng et al. 2017). The residual heat not taken up by the oceans increases land surface temperatures (approximately 3%) and atmospheric temperatures (approximately 1%), and melts both land and sea ice (approximately 3%), leading to sea level rise (see Ch. 12: Sea Level Rise). , , The meltwater from land and sea ice amplifies further subsurface ocean warming and ice shelf melting, primarily due to increased thermal stratification, which reduces the ocean’s efficiency in transporting heat to deep waters. Surface ocean stratification has increased by about 4% during the period 1971–2010 due to thermal heating and freshening from increased freshwater inputs (precipitation and evaporation changes and land and sea ice melting). The increase of ocean stratification will contribute to further feedback of ocean warming and, indirectly, mean sea level. In addition, increases in stratification are associated with suppression of tropical cyclone intensification, retreat of the polar ice sheets, and reductions of the convective mixing at higher latitudes that transports heat to the deep ocean through the Atlantic Meridional Overturning Circulation. Ocean heat uptake therefore represents an important feedback that will have a significant influence on future shifts in climate (see Ch. 2: Physical Drivers of Climate Change). The 1987 United Nations’ Brundtland Report (World Commission on Environment and Development) was the first platform to articulate the idea of “sustainable development” to a wide audience. The Report framed it as “…development that meets the needs of the present without compromising the ability of future generations to meet their own needs.” It posited that the only truly sustainable form of progress is that which simultaneously addresses the interlinked aspects of economy, environment and social well-being. The ocean plays a critical role in supporting human well-being, from providing food, livelihoods and recreational opportunities to regulating the global climate. Sustainable management aimed at maintaining the flow of a broad range of benefits from the ocean requires a comprehensive and quantitative method to measure and monitor the health of coupled human–ocean systems. 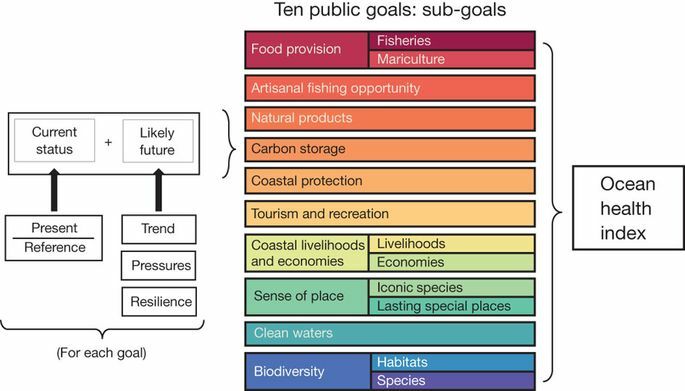 We created an index comprising ten diverse public goals for a healthy coupled human–ocean system and calculated the index for every coastal country. Globally, the overall index score was 60 out of 100 (range 36–86), with developed countries generally performing better than developing countries, but with notable exceptions. Only 5% of countries scored higher than 70, whereas 32% scored lower than 50. The index provides a powerful tool to raise public awareness, direct resource management, improve policy and prioritize scientific research. For six of the ten goals, production (or delivery) of the goal involves activities by people that can negatively feedback on the potential of the goal to be realized (for example, overfishing ultimately reduces the total catch that is available). The six goals include ‘food provision’, ‘artisanal fishing opportunity’, ‘natural products’, ‘tourism and recreation’, ‘coastal livelihoods and economies’, and ‘sense of place’ (for example, visiting cultural sites can have a negative impact on them). This type of sustainability is built into the status assessment for the goals for which it can be assessed and assumed to be neutral in other goals (for example, ‘sense of place’) for which we currently do not have research or data to inform how this feedback works. Results for individual goals may seem counterintuitive because we assessed ocean health through the lens of coupled human–natural systems. For example, extractive goals such as ‘natural products’ score best when harvest levels are high but sustainable, with inherent impacts on nature captured as pressures on other goals. The index represents the health of coupled human–natural systems. You can find a detailed description of the Ocean Health Index here. The website provides the OHI for all the countries with details of the methodology used; they are compiled annually and indicate changes within the last year. The next blog will focus on aspects and areas of the oceans that relate to livelihood and the vulnerabilities of individual countries. This entry was posted in Anthropocene, Anthropogenic, Climate Change, Sustainability, Water and tagged acidification, Adaptation, anoxia, Anthropocene, anthropocentric, Anthropogenic, atlantic, biodiversity, Brundtland report, Carbon, carbon storage, Clean Energy, Climate Change, Climate Change Denial, Climate Change Deniers, Climate Skeptics, CO2 emissions, coast, coastal, CSSR, deoxygenation, Economy, ecosystem, Emissions, Environment, Evaporation, extinct, extinction, fishing, food provision, Fresh Water, Future, Global Warming, goal, greenhouse gas, habitat, Health, heat, heat content, heat feedback, indicator, livelihood, marine, mass extinction, melting, Mitigation, NCA4, Ocean, ocean health, Ocean Health Index, Pacific, polar ice, Precipitation, rain, recreation, Salt Water, Science, sea ice, sea level, sea water, Sea-Level Rise, species, stratification, Sustainability, Temperature, Tourism, Variability. Bookmark the permalink.